Discover how easy it is to make our Cranberry-Pineapple Minis. With only 15 minutes of prep time, you'll be enjoying adorable cups of cranberry salad in no time. 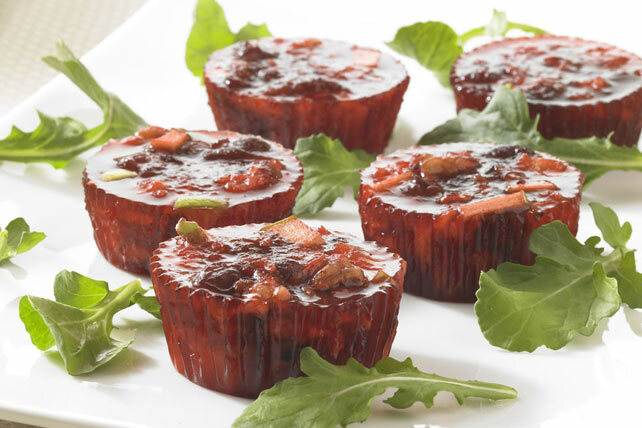 Serve Cranberry-Pineapple Minis at your next autumn dinner! Drain pineapple, reserving juice. Add enough water to reserved juice to measure 2-1/2 cups; pour into small saucepan. Bring to boil. Add to dry gelatin mixes in large bowl; stir 2 min. until completely dissolved. Stir in pineapple, cranberry sauce, nuts and apples. Spoon into 24 paper-lined muffin cups. Refrigerate 2-1/2 hours or until firm. Remove desserts from liners before serving. Prepare using JELL-O Cherry Flavor Gelatin or 2 pkg. (0.3 oz. each) JELL-O Raspberry Flavor Sugar Free Gelatin.